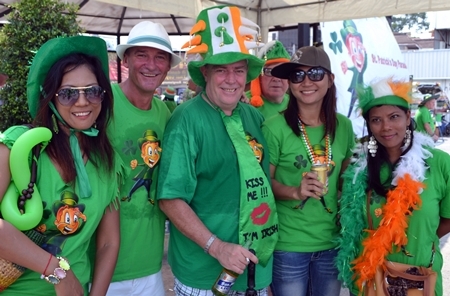 It may be Thailand, but everyone in Pattaya was Irish for a day as the city celebrated St. Patrick’s Day with a parade and cultural festival. 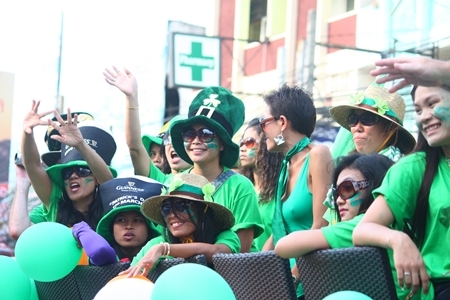 The third Pattaya St. Patrick’s Day Parade took place on the afternoon of Sunday the 17th of March and this event now has a permanent place on Pattaya’s social calendar. A week before the main event, on Sunday the 10th March, a Gaelic Football and tug-of-war competition took place on the playing fields at Arunothai School. The big surprise of the day was when the young children from the Father Ray Drop-In Center beat a team of international volunteers in the tug-of-war competition, though there were twice as many children pulling the rope. 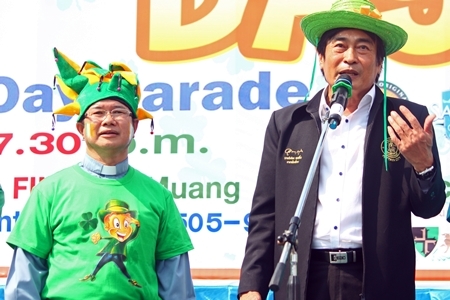 Deputy Mayor Ronakit Ekasingh (right), presides over the St. Patrick Day with Father Michael Picharn Jaiseri (left). 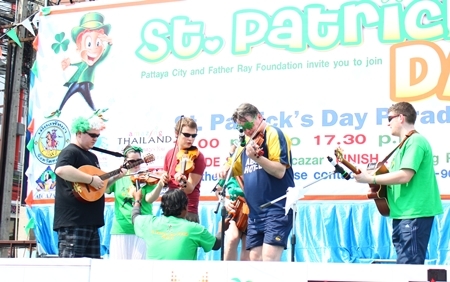 A group of musicians arrived from the Emerald Isle and performed at various Irish bars throughout the city as well as giving a special show at the Pattaya School for the Blind which saw the students jigging along to the music. 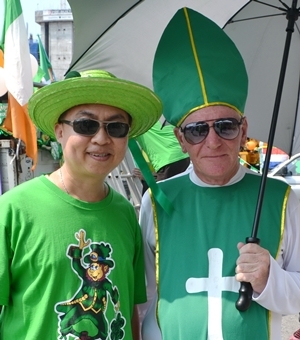 Derrick Kane, organizer of the event, gives instructions to St. Patrick. As in previous years, the parade started at Alcazar Theatre where Deputy Mayor Ronakit Ekasingh, officials from the Father Ray Foundation and Y.W.C.A. 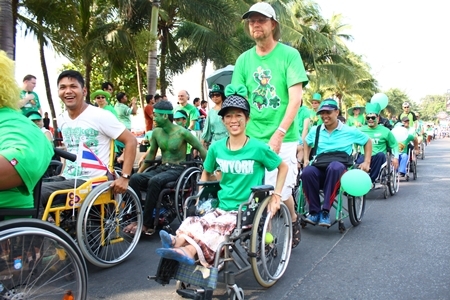 Bangkok-Pattaya Center Chairwoman Praichit Jetpai opened the festivities, before the parade made its way along Beach Road, finishing on the grounds of School No. 8. 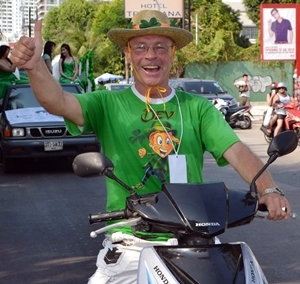 Marching bands from several local schools, dance troupes, Brazilian dancers, tourists, ex-pats, business owners, government officials and hundreds of local Thais all joined together with the local Irish community to ensure the parade was much bigger than in 2012. Along the way every car, person and motorcycle seemed to be decked out in green. As well as having as much fun as possible there was a serious side to the event and all money raised was donated to the Father Ray Foundation. 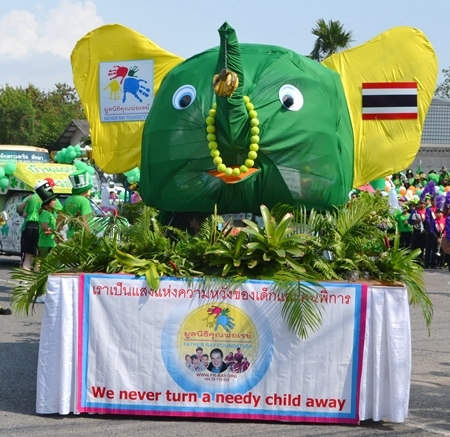 Children and students from all the projects managed by the Foundation took part in the parade and a total of almost seven hundred thousand baht was raised. 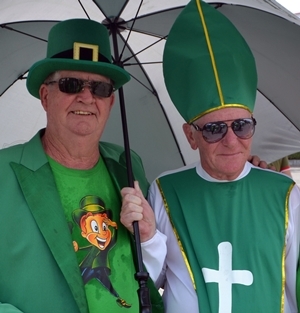 Father Peter meets Saint Patrick. The Father Ray Foundation float. 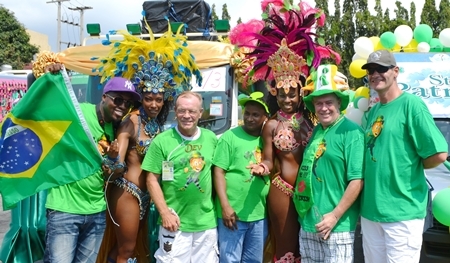 Paul Strachan (2nd right) parades with and Joe Cox (right) and the Defense International Security Services committee. 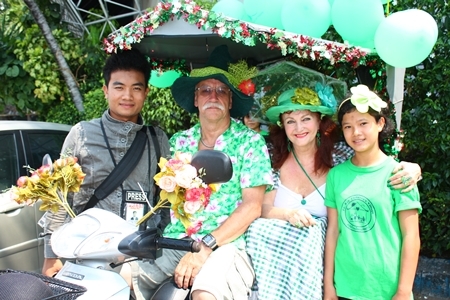 Pattaya Marriott Resort and Spa sent beautiful girls to celebrate St. Patrick’s Day. An Irish band plays Irish music to get everyone in the mood for St. Patrick’s Day. 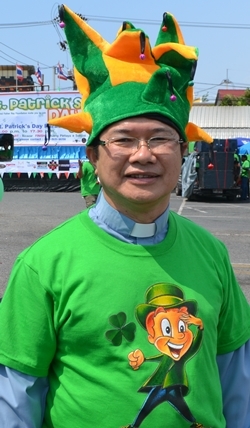 Chairman of the organizing committee, Father Michael Picharn Jaiseri. On St. Patrick’s Day everyone is Irish. 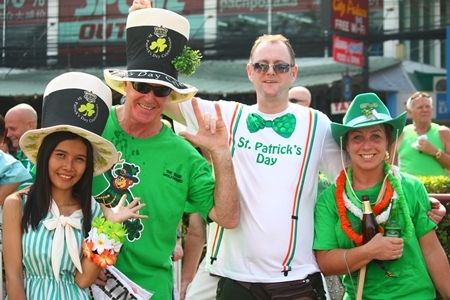 Visitors show how much they enjoy St. Patrick’s Day. The beautiful Brazilian dancers from Zico’s restaurants joined the marchers. The Father Ray Drop-In Center, winners of the tug-of-war competition. Parade organizer, Steven Deveraux, decided to ride rather than march. 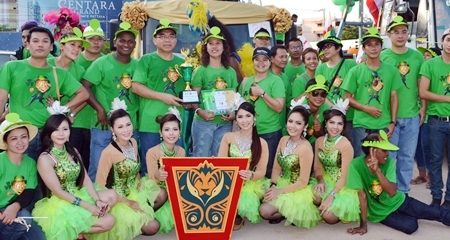 Centara Grand Mirage Beach Resort Pattaya – winners of the best decorated float trophy. 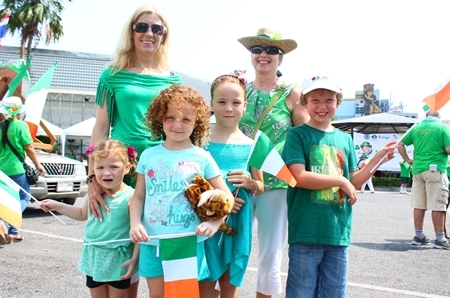 Children from Redemptorist Foundation perform some “Irish” dance moves outside Alcazar Theatre on St. Patrick’s day before the parade began. We all love St. Patrick’s Day. Along the way every car, person and motorcycle seemed to be decked out in green. Brazilians and Irish, two groups of people who know how to have a good time. 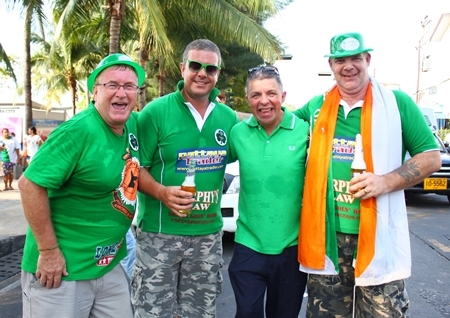 Everyone was dressed in green on St. Patrick’s Day in Pattaya. 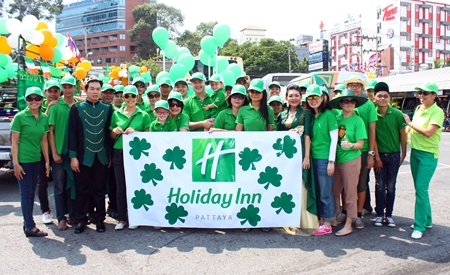 Holiday Inn Pattaya employees, led by Garth Solly (center), take part in the St. Patrick’s Day festivities. 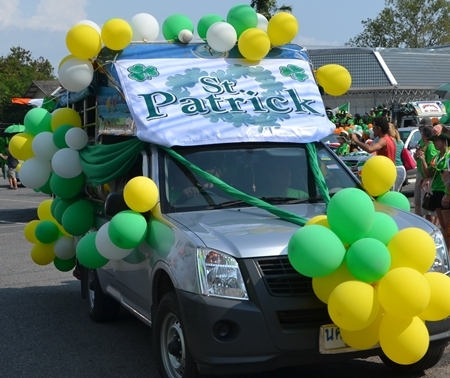 One of the many decorated vehicles that took part in the parade along Beach Road. 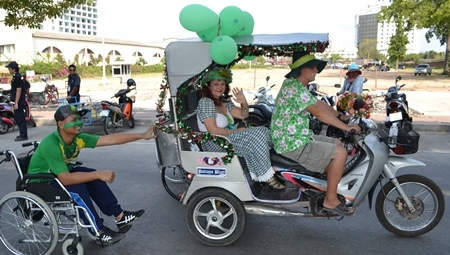 Pattaya Mail media celebrates St. Patrick’s Day with everyone else in Pattaya.